EXSTO is a French group serving three main business areas, namely offshore, automotive and industrial. The company has a presence in four strategic locations around the world, France (HQ), UK, Brasil and China, which enables the organisation to supply efficiently and successfully on a global scale. 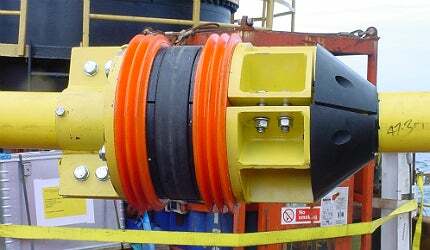 EXSTO is a world leading company in the manufacturing of large solid polyurethane parts, specialising in sealing and protection of risers, cables and umbilicals for the offshore industry. The headquarters in Romans, France, comprises of a 70,000 square feet facility and 150 staff. EXSTO recently invested in a building extension dedicated solely to the manufacturing of large parts, such as dynamic bend stiffeners. EXSTO has an in-house research and development centre fully equipped to perform chemical and mechanical material tests. The centre is used for testing materials for the development of new products, but also to expand our already large information database on the capabilities of existing materials and products. The business has a number of industry accreditations, including ISO 9001. During the years the company has received a number of customer awards for overall performance and health and safety. EXSTO is a leading supplier of dynamic bend stiffeners for riser installations. The product range has been expanding over time and the company aspires to be established as the world leader in the manufacturing of dynamic bend stiffeners. A team of expert polymer material engineers is continuously working to develop new solutions to meet the needs of the ever increasing demanding offshore environment. EXSTO offers, in addition to the above, a range of static bend stiffeners which can also be designed to suit customers’ specific requirements. Both products have excellent abrasion and impact resistance properties and can be used as crossing protection or impact protection. EXSTO manufactures polyurethane and steel bend restrictors for risers, cables and umbilicals. They can be designed for a very large range of load cases (bending moment, shear force) to suit specific customer requirements. The business has also developed special installation tools to allow a safe installation of heavy parts. EXSTO supplies two different types of marine anti-fouling products, namely cuproprene and cupromarkers. Cuproprene is a product supplied in strips, used to line pipes and protect them against marine fouling. Cupromarkers are anti-fouling labels, used in offshore structures for designating locations and valve positions. Both products base their protection performance to copper-nickel granules and have a proven track record of more than 20 years of use in the offshore industry. The company has developed and qualified two different polyurethane materials for use as insulation covers. EXSTO has a very long track record in the industry, and has supplied products in most major offshore projects, such as: Perdido, Skarv Idun Development, Pluto, Papaterra, Jasmine, Oselvar, CLOV, Agbami, Gorgon, Vigdis, Hibernia, Liwan and many, many others.